Dysbindin, or dystrobrevin-binding protein 1, is a coiled-coil-containing protein expressed in muscle and brain that was identified as a binding partner of dystrobrevin. Dysbindin upregulates expression of the pre-syptic proteins SP25 and sypsin I, thereby increasing glutamate release and promoting neurol viability through Akt sigling. In particular, Akt phosphorylation is suppressed with downregulation of dysbindin and increased with upregulation of dysbindin. A nonsense mutation of dysbindin causes Hermansky-Pudlak disease, an autosomal recessive disorder characterized by lysosomal storage defects and prolonged bleeding. Genetic variation in the gene encoding dysbindin is strongly associated with schizophrenia and protein levels are reduced in the prefrontal cortex, midbrain and hippocampus of brains from patients with schizophrenia. Haukvik, U.K., et al. Prog. Neuropsychopharmacol. Biol. Psychiatry 34(7):1259-1265(2010). Voisey, J., et al. Eur. Psychiatry 25(6):314-319 (2010). Ruano, G., et al. Pharmacogenomics 11(7):959-971 (2010). Hashimoto, R., et al. Nihon Shinkei Seishin Yakurigaku Zasshi 30(3):103-107 (2010). Voisey, J., et al. Behav Brain Funct 6, 41 (2010). 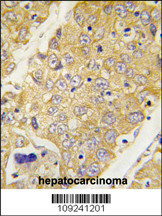 Formalin-fixed and paraffin-embedded human hepatocarcinoma tissue reacted with Dtnbp1 polyclonal antibody ( Cat # PAB2552 ) , which was peroxidase-conjugated to the secondary antibody, followed by DAB staining. 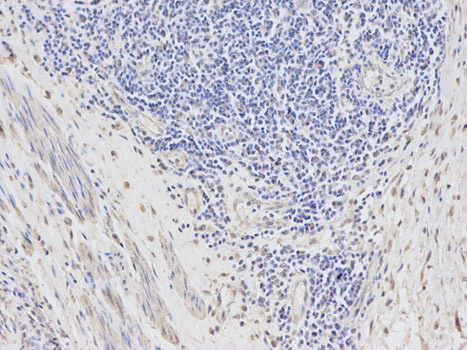 This data demonstrates the use of this antibody for immunohistochemistry ; clinical relevance has not been evaluated. 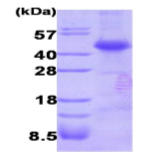 Western blot analysis of Dtnbp1 ( arrow ) using rabbit Dtnbp1 polyclonal antibody ( Cat # PAB2552 ) . 293 cell lysates ( 2 µg/lane ) either nontransfected ( Lane 1 ) or transiently transfected with the Dtnbp1 gene ( Lane 2 ) ( Origene Technologies ) . 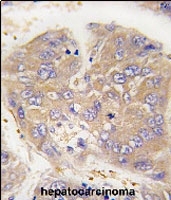 Formalin-fixed and paraffin-embedded human hepatocarcinoma tissue reacted with Dtnbp1 polyclonal antibody ( Cat # PAB2553 ) , which was peroxidase-conjugated to the secondary antibody, followed by DAB staining. This data demonstrates the use of this antibody for immunohistochemistry ; clinical relevance has not been evaluated. 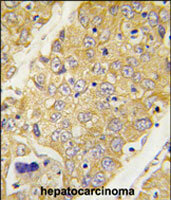 Western blot analysis of Dtnbp1 ( arrow ) using rabbit Dtnbp1 polyclonal antibody ( Cat # PAB2553 ) . 293 cell lysates ( 2 µg/lane ) either nontransfected ( Lane 1 ) or transiently transfected with the Dtnbp1 gene ( Lane 2 ) ( Origene Technologies ) . Western Blot analysis of DTNBP1 expression in transfected 293T cell line (H00084062-T01) by DTNBP1 MaxPab polyclonal antibody.Lane 1: DTNBP1 transfected lysate(38.61 KDa).Lane 2: Non-transfected lysate. Formalin-fixed and paraffin-embedded human hepatocarcinoma tissue reacted with Dtnbp1 Antibody (N-term) (Cat.#AP12328PU-N), which was peroxidase-conjugated to the secondary antibody, followed by DAB staining. This data demonstrates the use of this antibody for immunohistochemistry; clinical relevance has not been evaluated. Western blot analysis of Dtnbpt (arrow) using rabbit polyclonal Dysbindin/Dtnbp1 Antibody (N-term) (Cat.#AP12328PU-N). 293 cell lysates (2 ug/lane) either nontransfected (Lane 1) or transiently transfected with the Dtnbpt gene (Lane 2) (Origene Technologies). Western Blot analysis of DTNBP1 expression in transfected 293T cell line (H00084062-T02) by DTNBP1 MaxPab polyclonal antibody.Lane 1: DTNBP1 transfected lysate(39.50 KDa).Lane 2: Non-transfected lysate. Western blot analysis of DTNBP1 (arrow) using Dysbindin Antibody (N-term) Cat.-No AP51331PU-N. 293 cell lysates (2 ug/lane) either nontransfected (Lane 1) or transiently transfected (Lane 2) with the DTNBP1 gene. Western blot analysis of Dysbindin Antibody (N-term) Cat.-No AP51331PU-N in Hela cell line lysates (35ug/lane). This demonstrates the DTNBP1 antibody detected the DTNBP1 protein (arrow). Western blot analysis of Dtnbp1(arrow) using rabbit polyclonal Dysbindin(Dtnbp1) Antibody (C-term) (Cat.#TA300078). Formalin-fixed and paraffin-embedded human hepatocarcinoma tissue reacted with Dtnbp1 Antibody (C-term) (Cat.#TA300078), which was peroxidase-conjugated to the secondary antibody, followed by DAB staining. This data demonstrates the use of this antibody for immunohistochemistry; clinical relevance has not been evaluated. 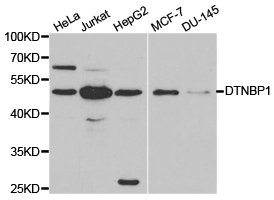 Western blot analysis of extracts of various cell lines, using DTNBP1 antibody. 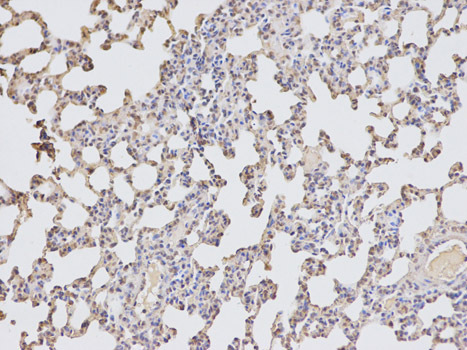 Immunohistochemistry of paraffin-embedded human esophageal cancer using DTNBP1 antibody at dilution of 1:100 (200x lens). 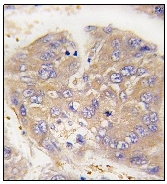 Immunohistochemistry of paraffin-embedded rat lung using DTNBP1 antibody at dilution of 1:100 (200x lens). 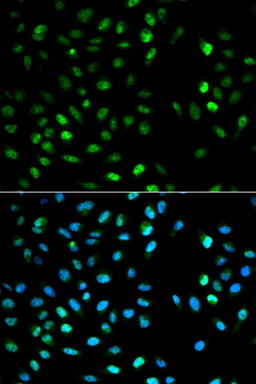 Immunofluorescence analysis of MCF7 cell using DTNBP1 antibody. Blue: DAPI for nuclear staining.